Many of us includes me initially how to get a right running shoe for my running! im been doing survey and research and looking at high and low at Low yat forum. Finally, i come to Health and Fitness section, where i found a Runnerz thread. i can feel i have come to the right place ask for the information on the running shoe. Its here where i meet him, Frank (Runnerz Circle Store) aka Phoenix ( Low Yat Forum). He intro me to the Runners Malaysia. He intro me to another shoe seller, Choi ( Ccube Sport HUB) Its was back to July / August 2008. In order for Choi to advise me on the right shoe, he need to know my foot type. So he asked me to do as wet test. This type of print looks like the whole sole of the foot is in contact with the ground. The low arch in this foot type is usually associated with overpronation and this is when the foot strikes on the outside of the heel and rolls inwards too far. If this is allowed to continue it can cause many different types of injury. Motion-control shoes with firm midsoles and control features that reduce the degree of pronation. Stay away from highly cushioned, curved-lasted shoes that lack stability and control. This is the least common of the three types of feet. The print shows that the band connecting the forefoot and the heel to be very thin or even non-existant. If you have feet like this then it tends to indicate that you underpronate (supinate) and are not very effective as a shock absorber. It is recommended that you only go for cushioned, neutral shoes without any motion or stability properties. Cushioned shoes with plenty of flexibility to encourage foot motion. Stay away from motion-control or stability shoes that reduce foot mobility. This footprint is the most common and suggests that you do not have any special requirements. Your feet will have an average sized arch and show the forefoot and heel connected by an even broad band. The motion of a normal foot lands on the outside of the heel and rolls inwards a small amount to absorb the shock. This would suggest that you are biomechanically efficient and can use any shoe you want to. As motion control shoes tend to be more expensive and heavier you might want to discount these shoes from your list. Shoes with moderate control features such as a two-density midsole. Back in 2008, im just a beginner with zero knowledge in running and also zero stamina too.. Fitness level at the lowest point of the life. Visiting local Nike / Adidas or which ever sport shops, who the hell so kind / free to explain all these kind of information to help you choose a right shoe! Lucky, through Choi, i know my feet type and also he recommended me a right shoe too! Saucony Triumph 5. Oh yeah, he also need to know your body weight to know where you are over-weight / BMI is normal. Since im neutral and over-weight, i need a cushioning shoe. ok, next questions, Saucony? Huh, im never heard of this brand before and Malaysia no 1 is selling the shoe! 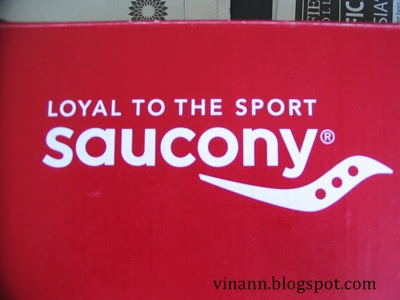 A quick google " Saucony". Wow, its 1 of the top running shoe brand in USA. 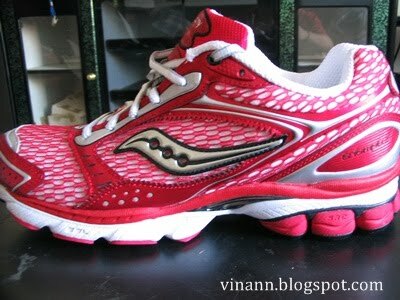 Without hesitate, second thought, im decided go for Saucony Triumph 5. 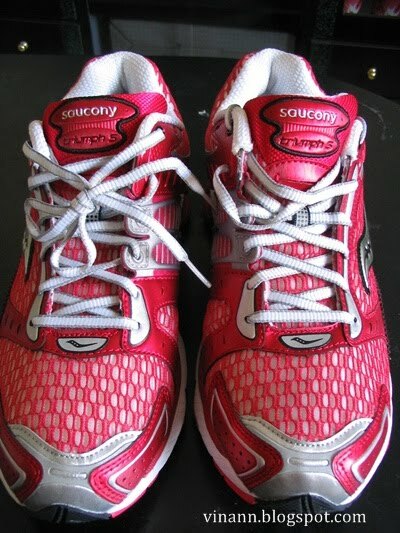 Since Aug 2008, im wearing my lovely red Saucony Triumph 5 running shoe and my fitness were improving. In Aug 2009, after wearing my Triumph 5, i got my second shoe. Triumph 6. Im just love the color of my shoe! After 4 months i got my second shoe, i have ran my 1st ever full marathon in December in Singapore, Standard Chartered Singapore marathon and the rest were history. Up to yesterday 9 months, my Triumph 6 have clocked total mileage of 680km plus and i can feel the cushioning is not as good before. Now waiting for my Next Shoe Kswiss to arrive in Malaysia!